Shoulder of lamb is quite fatty, but that’s what makes the meat so sweet and succulent, and by cooking it for a long time at a low temperature, the meat becomes so tender it just falls off the bone. This is the perfect roast to put in the oven and leave while you are out as it cooks slowly in the oven and you will return to a house full of wonderful aromas and meltingly tender meat. 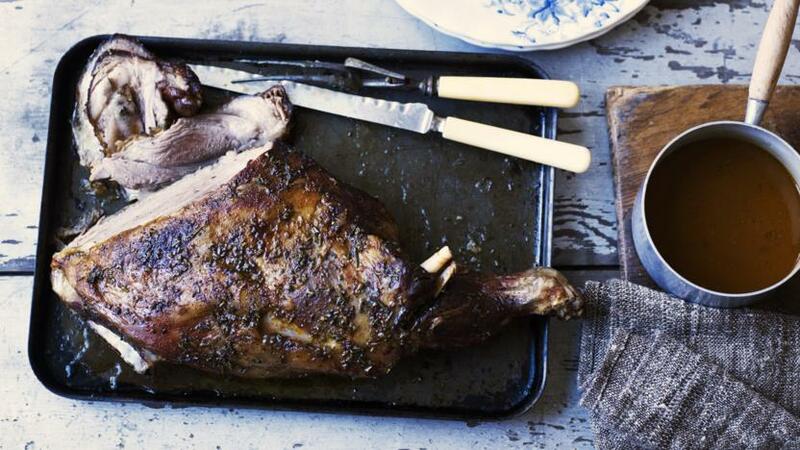 Serve it with fresh mint sauce. Put the lamb on a board. Mix the rosemary, oil and paprika together and season well with salt and pepper. Rub over the lamb on both sides. Put the onions and stock into a small roasting tin, put a rack on top then place the lamb on top. Roast in the oven for 30 minutes, or until brown then reduce the temperature to 160C/325F/Gas 3 (140C Fan). Cover the lamb with aluminium foil and continue to roast for 3-4 hours, basting from time to time until completely tender and the meat is falling off of the bone. Remove the foil and place the lamb on a plate to rest while you make the gravy. Skim off the fat into a bowl. Spoon two tablespoons of the fat into a saucepan. Sieve the roasting juices and softened onion into a measuring jug. Add boiling water to the jug to make up to 570ml/1 pint of liquid. Heat the fat in the saucepan until hot. Add the flour and stir until smooth. Still over the heat, add the roasting juices and whisk until thickened and smooth. Add redcurrant jelly and salt and pepper to taste and a little gravy browning if too pale. Serve with the lamb.